Cardio To Vegas! | Keep It Up, David! I log every mile that I complete doing any form of cardio, whether it’s running or biking, elliptical or ARC trainer, even swimming. I add up those miles, and track my progress on a map. It’s 274 miles to Vegas, and as I make my way along the route, I dig up interesting facts and pieces of history about all the places I “reach” along the way. It’s a challenge that combines my love of statistics with my love of trivia and history, and as an inspirational tool, it really works! Below is an archive of all seven CARDIO TO VEGAS posts – check ’em out! New Nerd Fitness Challenge: CARDIO TO VEGAS! My kick-off post, which includes a notorious gangster’s possible ties to the Los Angeles suburb of Fontana, and fun facts about the largest county in the United States. CARDIO TO VEGAS Update: Welcome to Phelan! Read about nearby Llano, California, which has ties to a world-famous novelist and was home to a failed socialist commune. CARDIO TO VEGAS Update: Hello, Victorville! The story of how “Citizen Kane” was born in a sleepy desert town. Plus, learn about the ambitious plans to bring high-speed rail to California. 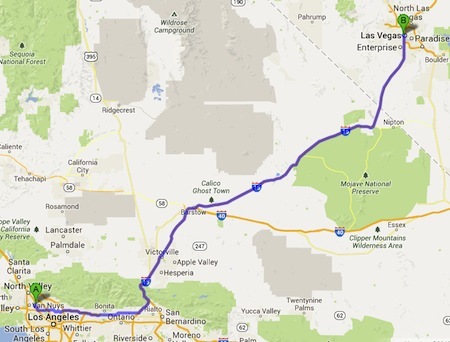 CARDIO TO VEGAS Update: Beyond Barstow I made it nearly halfway! Check out stories about the nearly towns of Calico, a ghost town, and Hinkley, who’s tragic past was turned into an Academy-Award-winning film. CARDIO TO VEGAS Update: The Middle Of Nowhere My longest leg yet inspired research about the world’s tallest thermometer and the Zzyzx Road exit, which was named by a lifelong con artist and crook. CARDIO TO VEGAS Update: Bye Bye California! I made it to Nevada! I’m barely past the border town of Primm, which is connected to two notorious figures from the ’30s… Bonnie & Clyde! CARDIO TO VEGAS Update: Viva Las Vegas! I reached my goal! See the historic location that served as my final stopping point, and get a better idea of how far I went. Interested in starting your own cardio map challenge? Check out step-by-step directions here!